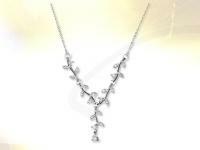 A beautiful .925 sterling silver necklace with acacia sprig motif. Acacia is a reminder of the legendary founder's virtues and duties: innocence, incorruptibility, warmth and light. Its presence is also a perpetual reminder of those who have attained such virtues . Necklace leaf masonic, silver Locust tree rhodié, adjustable 925/1000 of 45cm in 48 cms. This necklace consisted of 5 motives connects of locust tree, every leaf of which is set oxide of zirconium of 2mm of diameter is ended with an oxide of zirconium of 5mm of diameter set by 3 claws. Length of the motive 85 mm _ Height 35mm. This product was added to our catalog on Saturday 27 April, 2013.